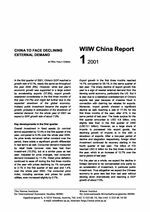 In the first quarter of 2001, China¿s GDP reached a growth rate of 8.1%, nearly the same as throughout the year 2000 (8%). However, while last year¿s economic growth was to a large extent supported by accelerating exports (27.8%), export growth weakened considerably in the first three months of this year (14.7%) and might fall further due to the expected slowdown of the global economy. Instead, public investment became the engine of growth, probably in anticipation of the slowdown of external demand. For the whole year of 2001 we expect a GDP growth rate of about 7.5%.